Former president Jimmy Carter, who in the past has been supportive of boycotts against Israel, is having his cancer treated by a “breakthrough” drug created in the Jewish state, according to reports. Carter, who is being treated for cancer in his liver and brain, said he has been making a recovery since taking a cancer drug known as Keytruda, which was created by Israeli doctors. 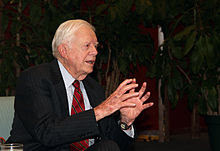 Carter has been a vocal critic of Israel. The drug is believed to be the next generation of treatment for cancer. Carter has not commented on the fact that this drug was made by Israeli doctors.